Standing on the summit of 500-foot Lava Butte south of Bend is to be grounded in Oregon’s volcanic past. This 7,000-year-old cinder cone (which erupted around the same time as Crater Lake’s Mt. Mazama) offers panoramic views of the string of Cascade volcanoes to the north — Mt. Bachelor, Broken Top and the Three Sisters. 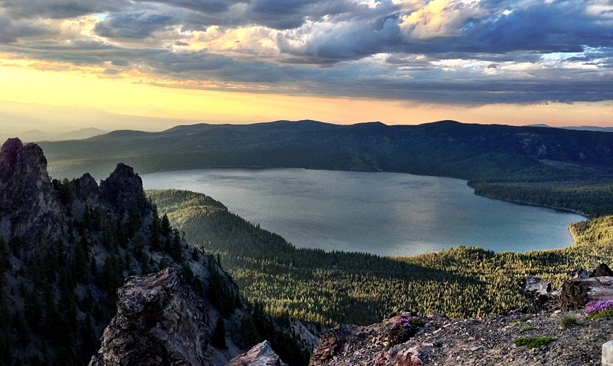 But the views to the southeast are truly arresting: Newberry Caldera, 30 miles away, and the waterfalls, lava flows, peaks and lakes in between are all part of the 54,822-acre Newberry National Volcanic Monument. The area includes more than 110 miles of trails for hiking, biking and horseback riding. Get to know this national monument, which celebrated the 25th anniversary of its designation in 2015. Lava Lands Visitor Center: What is now Lava Lands was created about 7,000 years ago after a volcanic explosion left behind a miles-wide sea of jagged lava rock, creating a unique geological landscape. Today, it’s the interpretive hub for the monument. Take a walk along the Trail of Molten Lands, a short, paved path through a lava field where NASA astronauts trained to walk on the moon in the 1960s. Lava Butte: Climb or take the shuttle bus up to the fire lookout on top of the cinder cone by way of a 1.5-mile road from the visitor’s center. Walk the .25-mile rim trail for panoramic views of the North Cascades and the entire Newberry National Volcanic Monument to the south. Lava River Cave: Located near the butte, this 1-mile-long cave was formed by molten lava that left an underground lava tube — the longest in Oregon. At 42-degrees Fahrenheit year-round, the cave is a cool underworld and home to a colony of bats. It can be explored on a self-guided tour and is open seasonally. Lava Cast Forest: About halfway between the visitors’ center and Newberry Caldera, the Lava Cast Forest offers a 1-mile, interpretive trail for exploring the ghostly landscape and its basalt casts of trees, logs and lakes that the lava flow left in its wake 7,000 years ago. 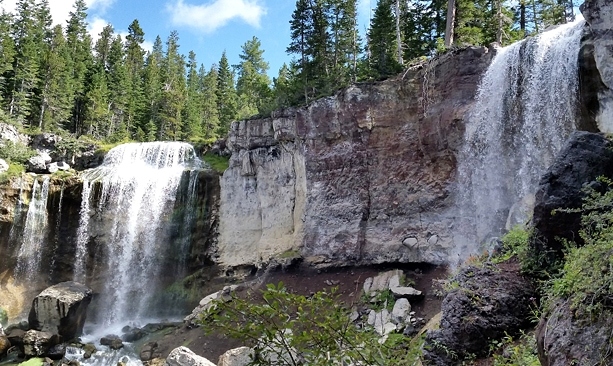 Paulina Falls: Further south in the monument lands, a short paved path takes visitors to a viewpoint of these double falls, which tumble 80 feet into the Newberry Caldera. From here, hikers can access a series of longer hikes on the Paulina Falls Trail — 1.6, 5.6 and 16.6 miles in length. Paulina Peak: At 7,984 feet, this summit is the highest point on the Newberry Volcano and offers tremendous views of the entire national monument, Fort Rock and Central Oregon. Visitors can drive to the top and also access more hiking trails here. Big Obsidian Flow: The youngest lava flow in Oregon, the 700-acre big obsidian flow rushed across the high desert here just 1,300 years ago. Explore a 1-mile interpretive trail and catch a ranger talk at the outdoor amphitheater. 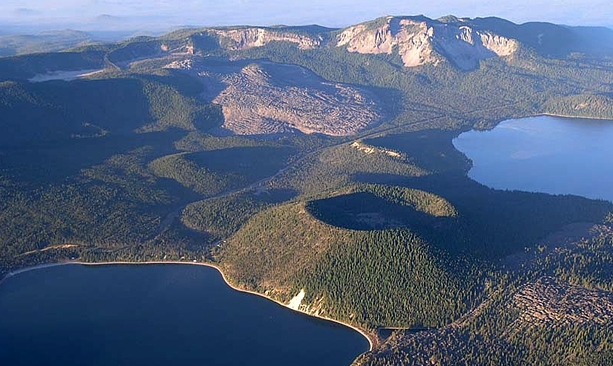 Newberry Caldera: Cradling the blue waters of East and West Paulina lakes, Newberry Caldera measures about four by five miles across and is said to cover a volcano that is 20 miles in diameter — the Cascades’ largest volcano. This mini-Crater Lake, which erupted about 6,100 years ago, remains seismically and geothermally active. Read more: Check out the Outdoor Project for a detailed trip report and maps of the Newberry National Volcanic Monument.